A customer that purchases a new iPhone now has up to one year to purchase AppleCare+ for the device, compared to 60 days previously, according to multiple people familiar with the matter. Apple has yet to update the fine print on its website, but MacRumors confirmed the extension with a senior AppleCare advisor. The change means that AppleCare+ can now be added to an iPhone as long as the device remains within its standard one-year limited warranty period. This brings AppleCare+ for iPhone in line with AppleCare for Mac and Apple TV, which can also be purchased up to one year after those devices are purchased. The senior advisor said the extension only applies to the iPhone, and it is retroactive, meaning iPhones sold within the past year qualify for AppleCare+ now. Multiple sources insist that the one-year AppleCare+ purchase window applies to the iPad, iPod touch, and Apple Watch as well, but we cannot confirm this info yet. Apple's eligibility tool does appear to reflect the change for iPhones in the United States, but not in the United Kingdom, Canada, Hong Kong, or elsewhere, so it is possible the longer purchase window will be U.S. only. "Eligible for AppleCare+" did not appear for an iPad or Apple Watch in any country based on our check. AppleCare+ costs $129 for iPhone 6s and newer and $99 for iPhone SE. The plan extends an iPhone's warranty coverage to two years from the original purchase date of the device, and adds up to two incidents of accidental damage coverage, each subject to a service fee of $29 for screen damage, or $99 for any other damage. AppleCare+ for iPhone also provides 24/7 priority access to AppleCare advisors via chat or phone for up to two years after the device's original purchase date. Without the plan, iPhone owners are covered by a limited one-year warranty and 90 days of complimentary telephone support. AppleCare+ for iPhone also covers EarPods, Lightning to USB cables, and batteries that retain less than 80 percent of their original capacity. In order to purchase AppleCare+ after the fact, separately from the iPhone, Apple must physically inspect the device to ensure there is no existing damage. Proof of purchase, such as a receipt, is also required. If purchased online, Apple requires customers to verify their serial number and run a remote diagnostic test. Update: Apple appears to have reverted back to a 60-day purchase window for AppleCare+ for iPhone, as confirmed with a support representative. In the long run, it's always cheaper to pay WHEN something breaks, not IF something breaks. There's a reason these warranties exist, and it's not to help you. Well that's pretty darn awesome. Good work Apple. You would be incorrect. One replacement cost without AC+ is more than AC+ and the deductible. If I break my iPad Pro 9.7 twice with AC+, I'm out $200 total. Without it, $758. My iPhone, $329 vs $619. It's just like your home and auto insurance, hoping you never have to use it, but there when needed. Exactly you proved the other persons point. Insurance is always calculated to benefit the company not the consumer. Apple calculated how to turn this into another revenue stream and settled on these figures to profit from it. Mathematically, the consumer never profits from insurance. As others have said, in the long run, you come out ahead paying WHEN it breaks, not paying in advance for IF it breaks. I like the new policy. I wish it was retroactive, seeing how I purchased said AC+ two months ago. I should have mentioned this. It's retroactive. 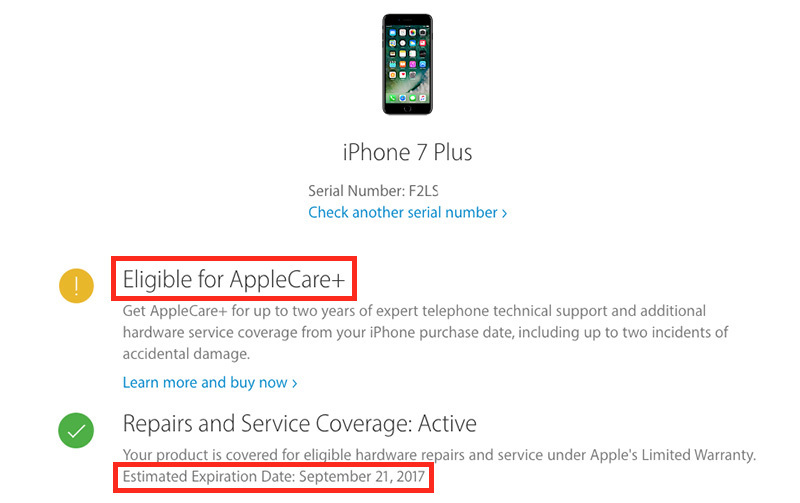 AKA my iPhone 7 Plus bought last September is now eligible for AppleCare+ (again, technically :D). If Apple could only remove the AC+ from their upgrade program (therefore lower the monthly cost) I would be all over it. I see no reasons for AC+ knowing that I would be getting a new device every single year anyway. Regardless of the type of insurance... Self-insurance works very well for those who have the financial resources, not so well for those who don't. You could argue, "If you can't afford to repair/replace it, you shouldn't buy it," but you'd be holding humanity to a standard that few could match. One may as well also say, "Pay cash for everything, it's cheaper than paying interest," or "Make it yourself, it's cheaper than paying someone else to make it." When the dollar amounts get larger, it's easier to appreciate the potential benefits. Pay $20,000 cash for a car today, it gets destroyed in a crash a few months later, pay another $20,000 cash to replace it. And that's assuming there are no deaths or physical injuries. Very scary proposition. Insuring a smartphone seems silly by comparison. I'd ask the self-insurers in the audience, do you also self-insure your healthcare, vehicles, and homestead? Or is this just a matter of degree? Insurance is a risk-mitigation pool. Something bad is going to happen to someone, that bad thing may have devastating consequences, so everyone chips in a bit against the chance that they may be the person to whom the bad thing happens. It also helps to have the attitude that, "If it benefits my neighbor rather than myself, that's OK, too." But the current fashion in the U.S. is to care nothing for ones neighbors, or the common good in general. Losers get what they deserve (as if losing was a character flaw, as if bad things never happened to good people). Like most other endeavors, insurance can be run as either a profit-making enterprise, or on a non-profit, mutual basis. Since it's the fashion to run everything for private profit and nothing for mutual benefit, why single out any one business for doing what society seems to demand? I understand all that. You misunderstood what I was conveying (probably my fault there). I purchased AC+ for my iPhone 7+ on 12/11/16. If the new policy had been in place then, I would not have purchased said care for a year. Give that I did so on the date I did due to the policy at that time, it would have been nice (although not realistic) to have the extra months added to my current warranty of AC+. I am not complaining mind you. I was just opining in a fanciful manner. Yeah then I don't understand what you mean by extra months added to your current warranty. There are no extra months. No matter how long after buying an iPhone that you purchase AC+, your warranty is going to end on the same day. Whatever day your warranty ends right now with you buying AC+ in December, even if you bought it right now, it would still end on the same day. If you're going to get AC+ regardless, it's much better to get it ASAP so you don't go longer without having accident protection. He proved me right, it has happened to me and each time it was never my fault. Just ball parking.. If I purchased AC for only my Apple products since 2007, it would cost me over $2000. My out of warranty repairs in that time period have been under $500. It's a no brainer for me not to buy it but I understand how insurance works having studied it and know it does not pay in the long term. Others may have had different experiences. Can you buy it on replacement devices? Meaning if I already got a warranty replacement, will they let me buy AC+? You're best to visit an Apple Store or contact Apple Support ('https://support.apple.com/contact') via phone.